Panforte Margherita for sale. Buy online at Zingerman's Mail Order. Gourmet Gifts. Food Gifts. 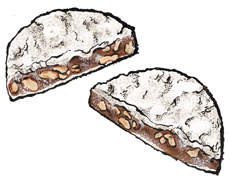 Panforte has been made in the Tuscan city of Siena for centuries. The story goes that it was eaten by the crusaders as they passed through Siena on their way to the East. Made with candied fruits, nuts, spices, and a bit of honey to pull it all together, panforte is calorie-laden food and keeps for months. It's kind of like a medieval power bar. You could still take panforte with you to fight your own epic battles, but today it's traditionally eaten as a Christmas cake. Panforte Margherita is one of the most classic combinations of flavors: candied citrus peel, almonds, and spices including cinnamon, nutmeg, and clove combine to create a cake that's rich, spicy, intense. The cake isn't leavened, so it has a texture similar to a fig cake or a dense brownie. It's phenomenal with a cup of coffee, alongside a nibble of cheese, or matched with a dessert wine like Vin Santo. A little goes a long way, and since it keeps so well you can put slices of panforte on your holiday dessert trays over multiple nights—it won’t go stale.